Join us for our first, of hopefully many, online meetings of 2018. 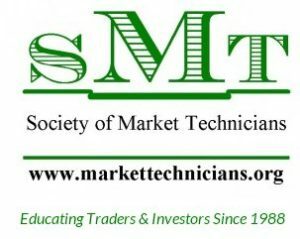 Dennis A. Kranyak, SMT President will review eight of his charts that helped him determine a correction was about to occur. He will review 5 of his predictive charts and 3 confirmation charts. Additionally, he will cover his method and tools he used to determined it was safe to get back in at relatively lower market levels. The online meeting will last approximately 1 hour 10 minutes, and Dennis will be in Swans Island, Maine conducting the meeting via HughesNet satellite internet and the Echostar 19 Satellite. Go to TeamViewer first, and determine you have access to the site. Send and email to Dennis at UnRulyDog@unrulydog.com with “SMT OnLine Meeting” in the subject line and tell him you would like to attend. Only SMT members will be allowed to attend. Email requests must be received by 6:00 PM (1800 EST), Tuesday, June 12th. First come first serve. If members have not logged into the meeting by 7:50 PM, the next member on the sign up list will be sent the meeting code to attend. Once members have sent an initial email request, Dennis will provide confirmation of where they are on the attendance list and further instructions regarding the conduct of the meeting. For those SMT Members unable to attend, the meeting will be recorded and the video posted on the SMT web site. *Those using a company laptop may not be able to get access to the TeamViewer software and site. You will need to use you personal PC or laptop. Members may pay dues on the SMT web site ($47) using either a credit card or PayPal. Web site and credit card payments are an additional $2 to cover SMT online banking costs. Dues increased to $45 in 2018. New members may join at anytime for the same dues and their membership will be valid for 12 months after the date of payment. SMT logo coffee mugs are available for purchase on the SMT website, $5 for members, $7.50 for non-members. If you are a member and have not picked up your SMT lapel pin, send and email to Sondra Katz. The new SMT logo Power Bricks are available for sale to members for $15, $17.50 for non-members, along with the new SMT logo golf shirts, for $25. All logo items are available on the “SMT Gear” web page.